Construction work in progress on the nave of the reconstructed Crystal Palace exhibition hall at Sydenham Hill. 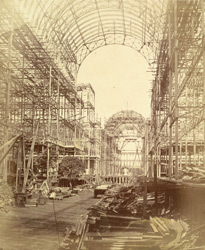 The building, which attracted more than six million visitors to a showcase of the century's technological achievements, was originally designed by Joseph Paxton to house the Great Exhibition of 1851 in Hyde Park. The prefabricated building was dismantled after six months and rebuilt in south-east London. Photographer P H Delamotte recorded the reconstruction of Crystal Palace in the new location until it was opened by Queen Victoria on 10 June 1854.